One of the most important decisions for long-term comfort in your Katahdin Cedar Log Home will be the level of energy efficiency you opt to include in your plans. 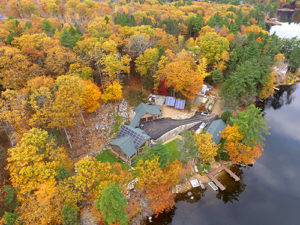 Log home energy efficiency is often more than simply meeting code requirements and has the potential to give you control over your living expenses for decades to come. With so many great technologies available, we firmly believe that choosing to make your home energy efficient is a smart investment that pays dividends over the life of your home. And, it’s based on this belief that Katahdin makes it easy to build a home that’s beautiful, comfortable and energy efficient. Federal and state guidelines mandate a certain level of energy efficiency for new construction, which has been adopted and codified on the state and local level. From the beginning, Katahdin’s Energy Envelope System (EES) was designed to meet and exceed efficiency requirements, without sacrificing the strength of whole log construction. 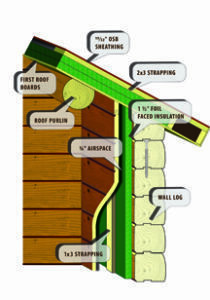 EES also saves labor costs because plumbing and wiring can be run inside the exterior walls without the traditional, time-consuming log drilling. The added benefit to this unique insulation system is that you have the flexibility to finish interior walls with any material you desire, including tongue and groove cedar to create a traditional log appearance. Katahdin log homes also offer the ability to construct a well-sealed log home, because the Northern White Cedar logs are so stable, with minimal settling or shrinkage. A well-sealed home will perform better than a leaky one, because it keeps the conditioned air inside and outside air outside. One way to ensure your new log home is well sealed is to bring a RESnet energy rater professional to your building team early on. RESnet is a means of measuring efficiency in both existing construction and new that compares it to an “average” US home. When it comes to resale value, an energy-rated home has a significantly higher resale value according to many studies. Some municipalities now are requiring energy scores, and RESnet provides a standardized score that is recognized in all 50 states. H ow is this possible? Presently, homeowners who install solar are eligible for a one-time 30% tax credit through the end of 2019. This credit decreases in subsequent years. At the state level, many agencies offer additional incentives to install solar arrays, heat with high efficiency heat pumps insulate and use energy- and water- efficient appliances. For more information on incentives in your area visit dsire.org. Once the solar panels begin producing on day one, you can count on free solar electricity for as long as 40 years with todays’ high production panels. 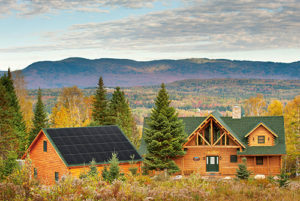 If you’re ready to explore more about adding solar, check out Katahdin’s Solar Ready Home program we’ve developed with the smart folks at ReVision Energy. Coupe also recommended some basic steps in the design when planning to include solar panels. Orient a dedicated area of your roof towards the south and try to keep the roof expanse simple, he explained. That will provide the greatest flexibility for planning solar installation. “Many folks are combining solar with heat pumps, battery storage and electric vehicle charging stations to maximize their power capabilities,” Coupe added. With any efficiency improvement that includes EES, air sealing and even solar, your Katahdin Cedar Log Home will meet basic energy efficiency standards and save you money. If your enthusiasm for efficiency demands more performance, Katahdin can meet those higher standards as well. One standard for proactive environmental and energy efficiency in homes is a Leadership in Energy and Environmental Design (LEED) certification. 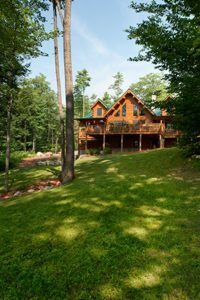 One motivated Katahdin customer explored the LEED limits with his New Hampshire log home by building a stunning, self-sustaining home that was awarded LEED Platinum, the highest level of certification. No matter how much energy efficiency measures you choose to incorporate into your new custom Katahdin Cedar Log Home, you’ll be well rewarded with a comfortable, economical home to enjoy for years to come!